The so-called Draghi put, more formally named "Long Term Refinancing Operation", through which the European Central Bank is offering almost unlimited liquidity with 3 years maturity at 1% yield, has proven unsuccessful at supporting the sovereign bond market. The big plan was that, by offering massive amounts of low cost financing to banks and financial institutions, they will park some of this excess cash into European debt instruments. Instead of this, it turns out that banks have chosen to deposit the funds back at the ECB and conduct small carry trades at the short end of the yield curves. 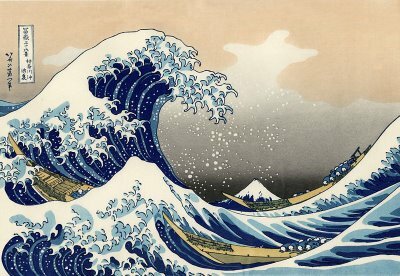 "The Great Wave off Kanagawa" depicted in the picture above represents a very good approximation of the effects of this "Operation Quantitative Easing in Disguise": its complexity and aggressive apearance looks threatening and capable of sinking the small fishing boats, but as most of us learned in school, it is just ebb and flow. Its effects may be great on the small fishing boats, but the Mount Fiji (pictured in background) is going see little denouements. These increased ECB figures go head in head with the announced decrease of reserve requirements, effective this Wednesday, from 2% to 1%. The shrinkage of reserve requirements should shore up more liquidity into the system and prompt banks to loosen their lending, but as shown by the increasing ECB deposits, banks are in fact tightening their lending. It translates into a text-book "liquidity trap" whereby injections of cash into the financial system by the central bank fail to bring down interest rates and therefore prove useless at stimulating the real economy. Other signals pointing out to an European liquidity trap is that, even though, short term interest rates are near zero, the significant increase in money supply does not affect the general price level. "Look at the front end of sovereign curves as a guide, rather than the back end. While FX markets are fixated by the back end of European sovereign curves as a sign of fiscal sustainability, fixed income investors continue to run a carry trade investing in the front end of the curves. For example, 3 and 6M Italian BTP yields have been dropping sharply even as the back end of the curve is a bit better bid. There is precious little credit and market risk in the front end of the curve but high yield. Banks can borrow at the ECB and pick up this premium. 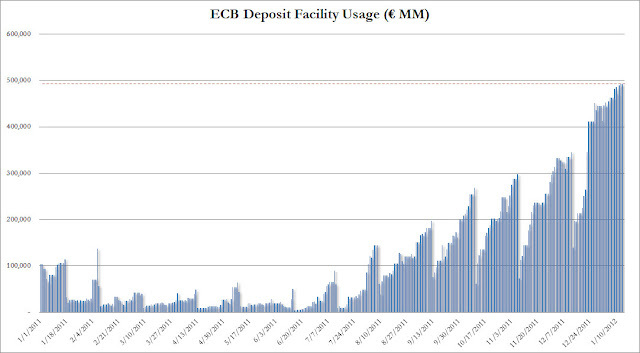 The ECB seems to be succeeding in restoring the plumbing of monetary policy. Investors are now scrambling to join the bandwagon which should prove risk supportive. This form of indirect credit/quantitative easing also suggests that EUR will have a tendency to drop and particularly relative to SEK, NOK and GBP." ﻿The European financial situation is still tense, and with more and more outbreaks in Greece, Italy and Hungary, 2012 will test if Keynesianism is truly the best economic policy in times of economic crises. Is it time to long USD/JPY ? Everybody join in the Too-big-to-fail bandwagon!